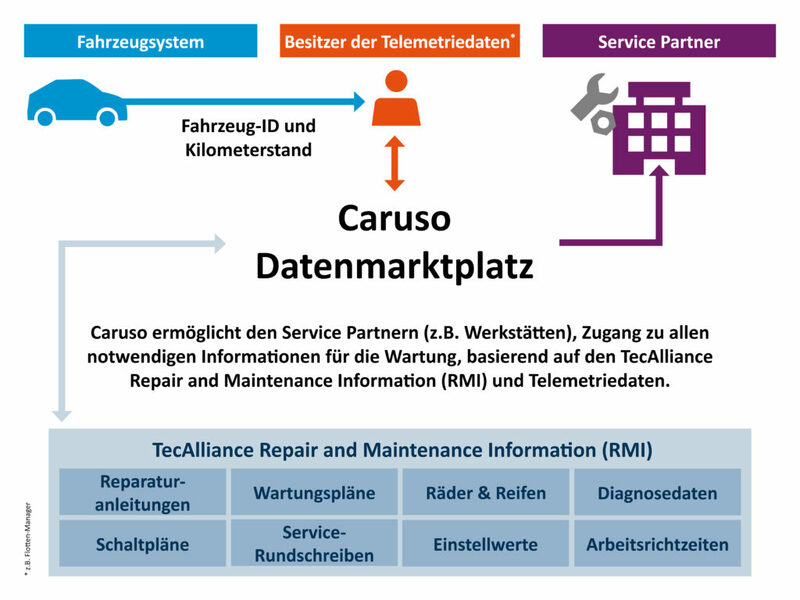 Ismaning, 20 November 2017 – TecAlliance GmbH, alongside telematics service providers such as Bosch, Continental and ZF, and car manufacturers including BMW, is one of the first companies to make its data available on Caruso. Caruso, the open, neutral and secure data marketplace for the automotive aftermarket, officially went live on 16 November and allows data users to connect data from different providers to optimise their business models or develop new ones. As a first step, TecAlliance is now offering its repair and maintenance information (RMI) via Caruso. In the future, it will also be possible to acquire individual data points via the Caruso marketplace using TecAlliance vehicle IDs, making the information easy to access, even for smaller businesses. As a forerunner in providing its RMI data (which includes information from technical manuals and leaflets, adjustment data, circuit diagrams and diagnostic information, for example), TecAlliance is enabling innovative businesses to develop entirely new services and apps in the networked automotive aftermarket. For providers of telematics services, fleet managers, leasing companies, workshops or parts dealers, this data offers a great deal of added value: as Caruso brings together data from a wide range of providers. The more providers there are on the marketplace, the wider the range of opportunities for users. Data consumers can choose between different providers, offerings or combinations of the two to obtain the optimum data for their requirements. For example, a fleet manager might obtain data for the entire vehicle fleet without needing to commit to a single provider. As an initial example of how the marketplace is used, the mileage of a vehicle can be read out at predetermined maintenance intervals, allowing all necessary maintenance information to be determined and forwarded automatically to all authorised parties via the Caruso platform. One might be the workshop, which then sets a maintenance date and at the same time orders the specific parts from the parts dealer. In future, insurers might also be able to process any comprehensive insurance claims that are identified during the inspection directly with the workshop, with the driver’s consent. In addition to this flexibility, Caruso users also benefit from the availability of TecAlliance data in a standardised and harmonised form that considers country-specific characteristics and OEM regulations. By working with Caruso, TecAlliance is making use of the opportunities of an additional sales channel for its data and services, which are being continuously expanded. The first users of this RMI data are the Scandinavian telematics service provider ABAX and the workshop software provider WERBAS. TecAlliance will be adding to the data it provides through Caruso on an ongoing basis. As a next step, it intends to integrate the querying of service details such as part numbers, price recommendations and labour times. “With Caruso we have the opportunity as a shareholder to help guide the digital transformation in the automotive aftermarket and take part in shaping an emerging industry standard. We also benefit from interactions with partners from all sectors of the automotive market and other industries in a diverse shareholder market,” said Jürgen Mehlis, EVP of Solution & Platform Management at TecAlliance, at the go-live event. “We are convinced that the digital aftermarket requires an open and neutral industry solution for the sale and exchange of data across different manufacturers and sectors. The Caruso digital data marketplace gives us the chance to direct our business model towards new market demands and new forms of value creation,” adds TecAlliance’s Managing Director Jürgen Buchert. For over 20 years, TecAlliance has been one of the world’s leading data specialists for networked collaboration in the digital automotive aftermarket. The portfolio includes services in the field of data mining (the collection of vehicle fleet data, spare parts data and repair and maintenance information across different manufacturers), the preparation of data for a wide range of market players according to specific target groups in line with the established TecAlliance standard, and the development of innovative solutions for efficient and transparent collaboration in the networked digital aftermarket. As one of the world’s leading suppliers, TecAlliance sets market standards in spare parts information and vehicle descriptions. The range is completed by services in the field of process optimisation, the implementation of solutions into existing business processes, and a timely support service. Market players worldwide all benefit from the extensive data basis of the TecAlliance platforms on which all the supply, demand and approval processes can be integrated and efficiently carried out. In this way, TecAlliance improves the digital business processes between business partners in the automotive aftermarket in a sustainable and lasting way. Today there are over 550 qualified TecAlliance employees from 26 nations working around the world, using their profound technical and industry knowledge of the automotive aftermarket to make data and processes more efficient. TecAlliance – the international driving force for standardised data, processes and integrated solutions in the automotive aftermarket. TecAlliance adquiere JNPSoft: Fortaleciendo nuestra posición en América del norte y nuestra presencia global.